"Yeah, yeah, yeah. 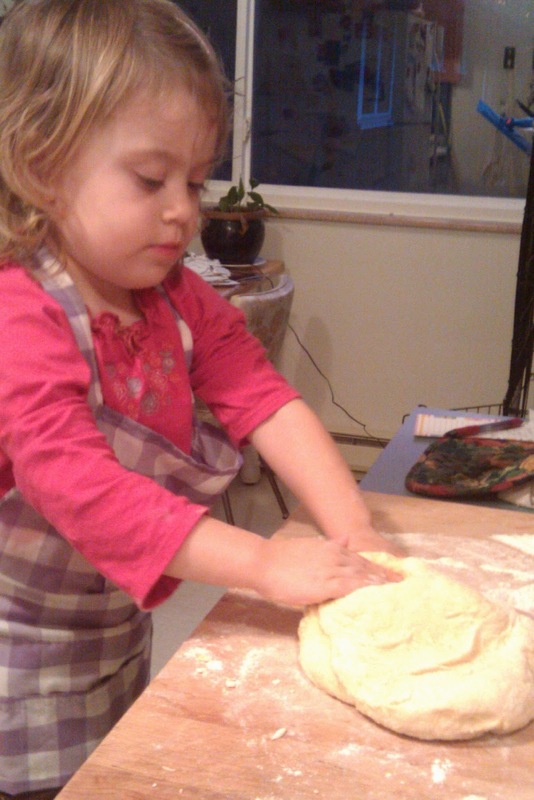 So a Chef specializing in making pasta showed you how to make gnocchi. I didn't see your hands in there. You didn't make anything. What does that have to do with me cooking at home for myself, my kid(s), or my family and friends?!" The point of this series is to show you that if I can cook it, you can too... and your monkeys can help! I met with Mike of Il Corvo Pasta a couple of Thursdays ago for our interview and gnocchi tutorial. I had planned to try my hand at making gnocchi the following Saturday, but I got busy... then this and that happened... you know... forgetaboutit!! Then, both Lorelei and I ended up having to stay home sick last Friday. 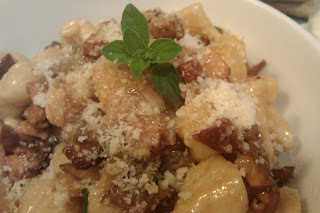 I decided that this was a good time for us to make our gnocchi; a comforting and definitely entertaining dish to make. We turned off princess movies and SpongeBob for a while and cooked together. Peel them while they are still hot. Then pass them through a ricer/food mill and let them sit out at room temperature for two hours or so to let them cool down and dehydrate a bit. I know, not nearly as fluffy and Mike's, but not bad, huh? Huh? 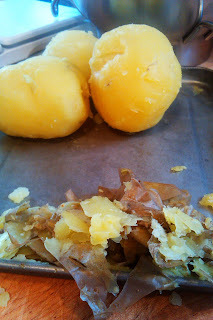 I let the riced potatoes sit out for as long as I was patient, then I began to pass my fork back and forth through them hoping to High Hell that they would fluff up as nicely as Mike's had. There was no freaking way that those potatoes were going to be as 'delicately fluffy' as they were at Il Corvo that cloudy yet red-neon-light-drenched morning. (You just have to read my last post to get where I'm going with this imagery. Here, go now.) I'm not sure what I did differently, but I had faith in myself and in the fact that it was only three potatoes; if nothing else I could mash them and serve 'em up with a chicken. 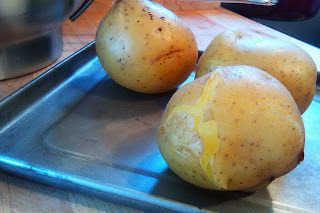 I'm fairly certain that those potatoes heard me, because after fifteen to twenty minutes in a 200º oven (and with careful tending) they came out great!! 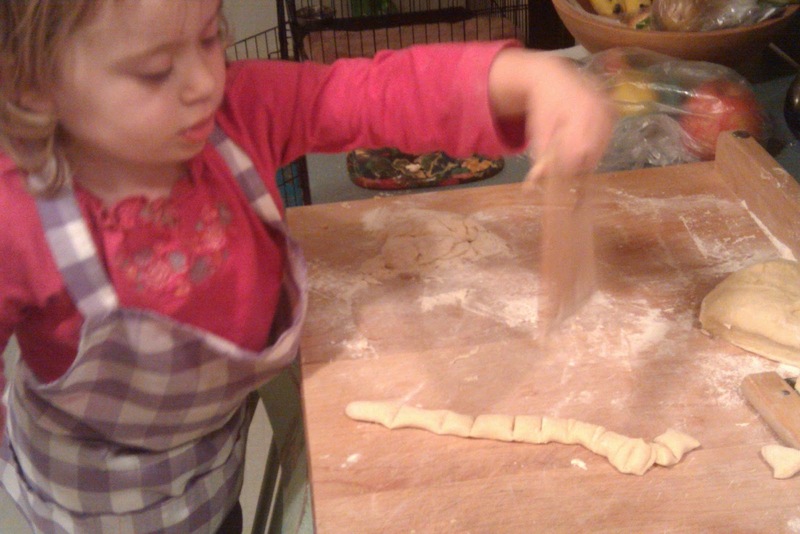 The best part about making these gnocchi at home was kneading the dough, rolling it out into long snakes, and cutting them into bite-sized pieces with Lorelei. 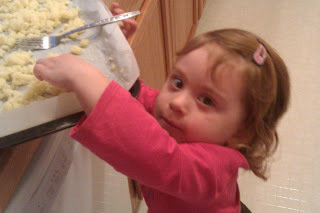 My little girl really wanted to help. She pulled up a chair, grabbed the apron that her Grannie made for her, got her hands in the dough, rolled out the snakes like a pro, and cut them into pieces with her own tool. "No mom. No, no. Like this." she said, all the while pushing my hands out of the way to get to her work. Chop, chop, chop. Note: One thing that I really want to stress about this last step, the cutting of the snakes into the final pieces of gnocchi step, is that you really need to have plenty of flour on hand to dust the freshly-cut pieces so that they don't stick together. You can't use too much flour at this point. 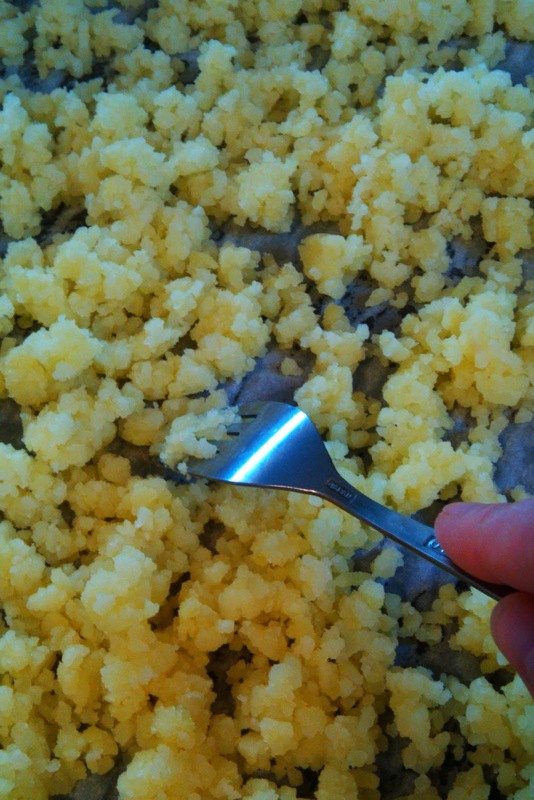 The gnocchi won't get too dry or gummy; they'll get gummy of you don't use the flour. When the dough was all cut and ready, I boiled up the little pillows and tossed them in a simple sauce: here I sauteed some chanterelle mushrooms with some shallots, chicken stock, salt and pepper and butter to finish. Truth be told, at this point it wasn't about the sauce; it could have been just olive oil and herbs. What really mattered was that Lorelei and I had spent some creative, productive, and cuddle-filled time together. The bonus was the gnocchi. Thanks again, Mike, for the lesson on how to make a yummy dinner that is certain to please many for a long time and for the foresight of knowing that making gnocchi is at least a two-person job. You may notice in the pictures of Lorelei working that the fruit was covered with plastic. Yes, I am an awesome mom and had the foresight to cover things knowing that flour and dough would fly. And it did. I did not, however, think about the floor. I would recommend a drop cloth. 'Nuf said on that topic, huh? What a fun and informative post! LOVE LOVE LOVE your blog! So glad you liked it! I do indeed have a Facebook page. We love to make gnocchi at home and it's incredibly easy to do. We don't have a ricer or food mill either, so instead, we use a fine cheese grater. It works well for an at-home meal. Love the blog! Keep up the good work!